MINNEAPOLIS, MN --- E-Switch announces a new long life sealed tactile switch, the TL6200. The TL6200 series tact switch offers a long operating life of 10 million cycles and is rated to IP67 standards. 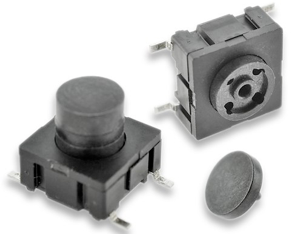 This tact switch comes in both SMT (gullwing) and thru hole termination options, and offers multiple actuator lengths.